Figure 8-31. - Caisson breakwater or jetty. 70 feet. The width of its base depends on the width of the cap, the height of the structure, and the slopes of the inner and outer faces. For a deepwater site or for one with an extra-high tide range, a rubble-mound break- water may be topped with a concrete cap structure, as shown in figure 8-30. A structure of this type is called a composite breakwater or jetty. In figure 8-30, the cap structure is made of a series of precast concrete boxes called caissons, each of which is floated over its place of location and then sunk into position. A monolithic (single-piece) concrete cap is then cast along the tops of the caissons. Sometimes, breakwaters and jetties are built entirely of caissons, as shown in figure 8-31. A GROIN is a structure similar to a breakwater or jetty, but it serves a third purpose. A groin is used in a situation where a shoreline is subject to along shore erosion, caused by wave or current action parallel or oblique to the shoreline. The groin is run out from the shoreline (usually there is a succession of groins at intervals) to check the along shore wave action or deflect it away from the shore. A MOLE is a breakwater that is paved on the top for use as a wharfage structure. To serve this purpose, it must have a vertical face on the inner side, or harborside. A jetty may be similarly constructed and used, but it is still called a jetty. These structures are constructed parallel with the shoreline to protect it from erosion or other wave damage. They are covered as follows. A SEAWALL is a vertical or sloping wall that offers protection to a section of the shoreline against erosion and slippage caused by tide and wave action. A seawall is usually a self-sufficient type of structure, such as a gravity type retaining wall. Seawalls are classified according to the types of construction. A seawall may be made of riprap or solid concrete. 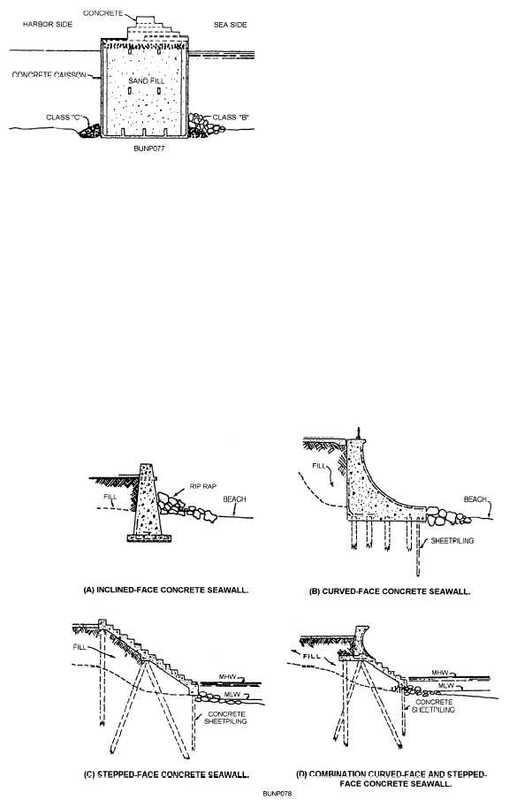 Several types of seawall structures are shown in figure 8-32. Figure 8-32. - Various types of seawalls.